In certain respects whole life insurance may seem like a good deal. After all, it’s permanent insurance and includes an investment provision. Who could argue with that? However, there are several reasons why term life insurance may better suit your needs. This is the main reason why anyone buys term life insurance rather than whole life. Term life insurance is not just cheaper than whole life, it’s a lot cheaper. If a whole life policy cost you $1,000 for the annual premium, you can generally get the same amount of coverage on a term life policy for $100-$150. For many people and families who are tight on money, term life insurance can often be the difference between having life insurance and forgoing coverage. Whole life can be expensive, especially if there are several people in the household who you need to buy insurance for. Many young families in particular can’t afford to do this. The fact that term life insurance is so much cheaper than whole life also opens up a lot of other advantages. If you need $250,000 – or even $500,000 – in life insurance, and try to get it with whole life, you may find that you can only afford a $50,000 policy. But because term life insurance is so much less expensive than whole life, it is much easier to buy the amount of coverage that you really need. Whole life insurance may work if you only need a relatively small amount of coverage – say, enough to clean up final expenses and pay for any remaining medical expenses. But if you plan for your life insurance to provide for your family after your death, term life insurance will be by far the better way to accomplish that. Because it is so much less expensive, you can buy a lot more of it. One of the big advantages touted with whole life insurance policies is the fact that in addition to providing a death benefit, it also has a saving and investment feature. Some of your premium goes to pay for your life insurance, but most will go into an investment account that is part of the policy. Over time you can build up a fairly large investment account. That sounds impressive – until you look closer. For starters, during the first few years of the policy, most of the money that would go for the investment portion actually goes into fees. These fees are primarily commissions for the insurance company to set you up in the investment account. Relatively little of your premium will go into the investment portion in the first few years, and you may be disappointed at how little money is actually in the account. The second problem – an even bigger one – is that the return on money invested with insurance companies tends to be sub-par. Generally speaking you will do better on your own if you invest an equivalent amount of money into a no-load index mutual fund. Not only will returns on the fund be better than what you can get with the insurance company, but you won’t have to pay the commissions in order to get it. This is where the saying “buy term, and invest the difference” comes from. The recommendation is that you buy a term policy for as little as possible, then invest what you would pay for an equivalent amount of whole life insurance, in your own investment account. In the long run, your investment performance will be better – and you’ll still have life insurance coverage. Because term life insurance covers very specific time periods (five years to 30 years), you can buy a policy specifically to cover a certain need. Let’s say that you have a mortgage with 20 years remaining on it. You can buy a term life insurance policy for 20 years, and once the mortgage is paid you no longer need to renew the insurance. Whole life insurance policies sometimes add term riders to the policy to cover just such contingencies. But you can do this on your own, without having to sign up for a whole life policy. You only need life insurance until you have saved and invested enough money that you are in effect self-insured. You may only need life insurance for as long as you have dependent children. You may no longer need life insurance when all of your debts are paid. For most people, the need for life insurance is temporary, or at least it peaks at certain times in life and is less important in others. 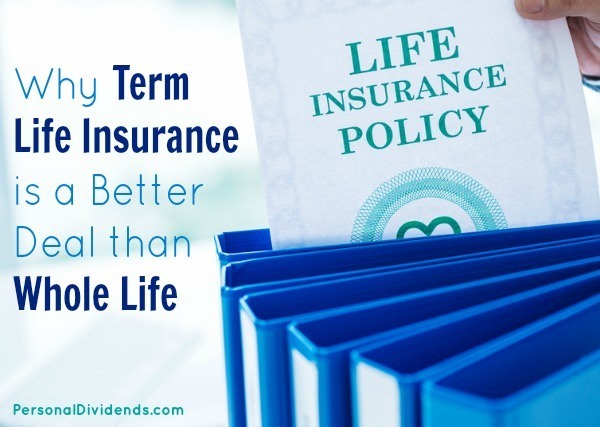 With term, you can keep the policy only long as you need it and in doing so you won’t spend any more for life insurance than you absolutely need. Term’s the way to go, thanks. Whole life insurance generates far higher commissions for insurance sellers, so naturally they push it. Resist!